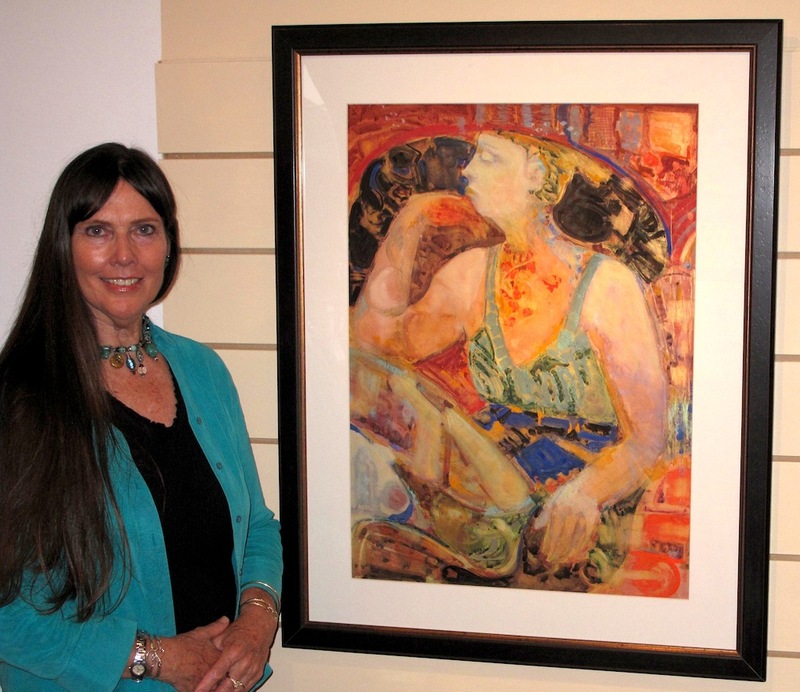 Kimberly with contemporary artwork entitled "Room For Reason"
My paintings are a reflection of emotional response. Inspired by revelations discovered within both the subject and myself, I manifest art. This may involve creating in the moment or drawing from past experience. St. John US Virgin Islands, my home since 1980, offers boundless inspiration. While exploring above and below the ocean, I sketch and paint plein air. In my studio, art forms are referenced from sea and sky, flora and fauna, people, architecture and the imaginative intuition that ignites my fascination and emotion. Working in oils, pastels and gouache, I paint in both traditional and contemporary styles. Applying these mediums to canvas, board or paper using various implements (brushes and pallet knives), I manipulate colors and temperatures, light and shadows, shapes, lines, values and textures. Within the creative process of drawing and painting, use of light and color may give way to no color at all as the method to reveal raw beauty. Immersed in this activity of making choices, I love the feelings generated by the journey toward each particular desired result. Constant is my love of nature and observation of human character. My spirit finds balance while painting and nourishes the ever evolving process of feeding the soul. Nature has been my greatest inspiration, my greatest teacher. I grew up in Central Valley California surrounded by many farm animals and wild animals in a fairly natural environment. I was a constant and patient observer and very interactive with lives whose mode of communication was not the human language. I also lived with four siblings. This mode of living was my most formative foray into art - observation and sensing life. Other education: My most memorable moments in grammar school where those of drawing and painting. High school – a profound summer trip to Hawaii set the course of my life - I was tropics - bound. I have never looked back. But first, college – biological, geological, oceanographic and wildlife management sciences, a black and a white photography course and hiking and backpacking in Humboldt County and surrounding areas were my methods and materials. Following college, cameras in hand – Mexico, Central America, Africa. Under water biological research in the Indian Ocean for 18 months on Aldabra Atoll, which was teaming with giant tortoises, birds and a plethora of marine life. Heaven. Graduate work in Puerto Rico on coral reefs; met and married the love of my life, Rafe, then went HOME to beautiful St. John, 1980. We were blessed with 2 children - Devon and Revel, and grandchildren, and have lived there happily ever after. In the mean time, along came art books – very many, and museums and galleries, and supplemented with very specific workshop instructors/philosophers: David Millard, John Osborne, David Leffel, Sherrie McGraw, Gregg Kreutz, Hongnian Zhang, Lois Wooley, Carla O’Connor and Richard Schmid (through everything I can find of his). Like a sponge I absorbed their unique teachings to augment my observations. There were also trips to a Portrait Convention in Chicago, a Pastel Convention in Albuquerque, and to Italy (my home in another life, I’m sure). Through it all, I have had my goodly share of mentors, human and other life forms. And I painted. And I paint. And never stop observing – Ever.